emissions every year for 5 person plants when compared to the current UK market leading Sewage Treatment Systems. FilterPod prices are no more than that of Biodisc systems. Because FilterPod treatment systems work in a unique way they offer many advantages over all aquatic based plants. 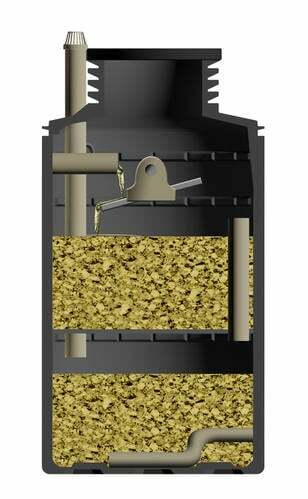 FilterPod treatment plants clean the sewage to an astonishing level of purity. They achieved a final effluent with a 97% reduction in pollutants during the EN 12566-3 test period when following a 2 stage settlement tank. This is a lot cleaner than the leading UK electric sewage treatment plant that sells for the same price. FilterPod treatment plants have the smallest carbon footprint of any sewage system. Typical single house plants produce 0.55 Tonnes of Carbon Dioxide emissions every year for the process. The FilterPod produces NONE as it uses NO ELECTRICITY. FilterPod Systems have a carbon footprint that is 3 times less than a septic tank/drainfield or septic tank/reedbed, as drainfields need replacing when they clog and reed beds have to be replaced every 7 to 10 years. FilterPod tanks have a 10 year warranty. Compare this to the 12 month warranty offered by the leading electric plant manufacturers. All wastewater treatment plants do a similar job (though some produce cleaner effluent than others) but it is how they do their job that makes the difference. The FilterPod® filtration technology for wastewater treatment is in direct alignment with the World Health Organization’s current recommendations for addressing the global water crisis. The World Health Organization policy brief on Water Health and Ecosystems includes the following recommendation: "Natural ecosystems have intricate and resilient mechanisms that filter and replenish freshwater resources and sustain marine environments. Although human technologies may enhance or replicate these mechanisms in some settings, protection of the natural watershed also is critical. An 'ecosystem approach' recognizes and ascribes value, including economic value, to the services' natural ecosystems provide in terms of water filtration and purification, and ensures their sustainability, through modern management regimes."